Driveway Pavers | Concrete Driveway Pavers - Tile Tech Inc.
Driveways are pathways that link the parking areas from the main road. They guide vehicle traffic towards the right destination and serve as demarcation between vehicles, lawns and pedestrians. These reasons ensure fewer occurrences of accidents and a more efficient flow of traffic. Driveways are essential elements of homes and commercial establishments. With the shift in trends of popular hobbies and past times, brought about by the cocooning wave, American homeowners are turning their attention to projects that can enhance their humble abodes. A plethora of themes and concepts have served inspirations to develop a wide variety of available materials for home improvement projects. Home improvement materials include driveway pavers that come in several colors and shapes that can be laid in different patterns. Driveway pavers give old, cracked, stained concrete or asphalt driveways that much needed make-over. Driveway pavers can be classified based on the type of material as well as on the type of paving surface. Based on the type of material used for the pavers, there are three main types: concrete pavers, natural stone pavers, and brick pavers. Concrete pavers are manufactured using concrete. Brick pavers are made using clay. Natural stone pavers are shaped from naturally occurring rocks such as granite, limestone and sandstone. Considering the type of paving surface, there are two types: mortared pavers and mortarless pavers. Mortared pavers have mortars installed between the pavers, creating a hardened, non-flexible surface which may be susceptible to cracking. Mortarless pavers on the other hand, are laid down on a compacted base typically composed of crushed gravel, stones or recycled concrete, and coarse sand. After laying the pavers, sand is placed on top and is compressed into the gaps between to lock each piece together. The end result is a flexible surface the will not crack over time. Mortarless driveway pavers are preferred over mortared driveway pavers due to the ease of maintenance and repair. When part of the driveway cracks, pavement pieces can be easily pulled out and replaced without damaging a large portion of the path. Installing driveway pavers promotes creativity and provides flexibility. Home owners are given the freedom to customize driveways according to their personal preferences. Pavers are in general slip resistant to prevent skidding particularly during winter. These materials also highlight the path to ensure that traffic is effectively directed to the proper parking space. 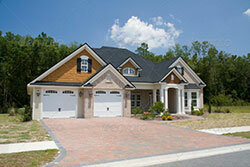 Ensure driveway safety while increasing curb appeal with driveway pavers. As more and more homeowners grow tired of looking at their ugly, stained or cracked concrete, dirt or asphalt driveway they are turning to beautiful, durable and maintenance free driveway pavers. It wasn’t long ago when deciding on a driveway material was easy: asphalt or concrete. Today, the concrete choice has expanded to include a multitude of decorative concrete options. There are two types of driveway pavers: mortared and mortarless. Mortared pavers have mortar between the pavers and thus create a hardened non-flexible surface. This type of surface is prone to cracking and makes replacing a section or a paver more difficult. Mortarless pavers are the preferred method. Instead of mortar a special mixture of sand is used to make a very solid but flexible driveway surface. And if a paver ever breaks or cracks, replacing it is very easy.